Followers of this blog will no doubt have noticed that I haven't been particularly active over the last 6 months or so. Truth is, I haven't really done much hobby-wise over that time either, so have little to show. 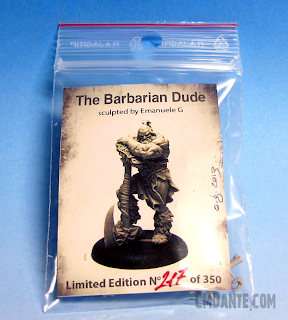 I have, however, still been buying the odd miniature or kit here and there - one such miniature, the limited edition "Barbarian Dude". 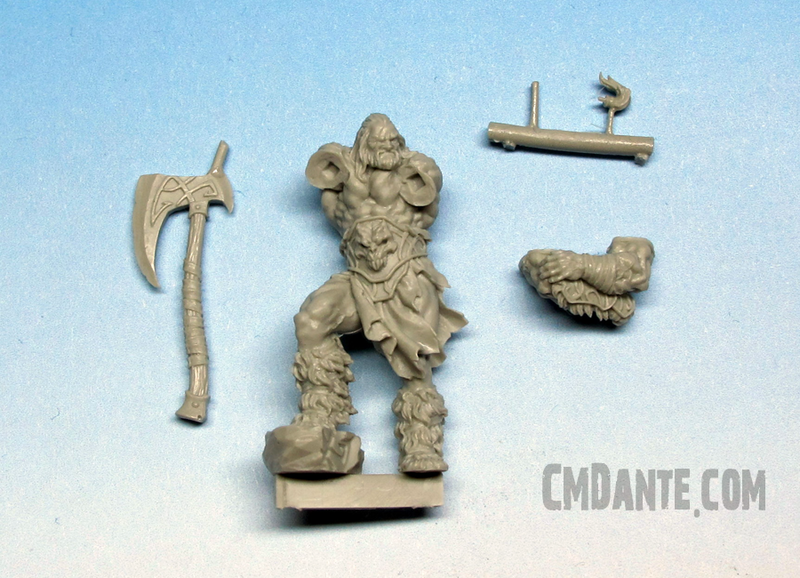 The Barbarian Dude is a new sculpt by the talented Emanuele Giovagnoni from Raining Frogs Garage. Cast in resin and produced in 2 runs, the figure was strictly limited to only 350 prints. Unfortunately for anyone thinking about picking up a copy, the figure is already completely sold out. The figure cost 15 euros, plus 3 euros postage and packaging, or about £15 in UK currency. Ok, the boring stuff first so I will keep this fairly short. 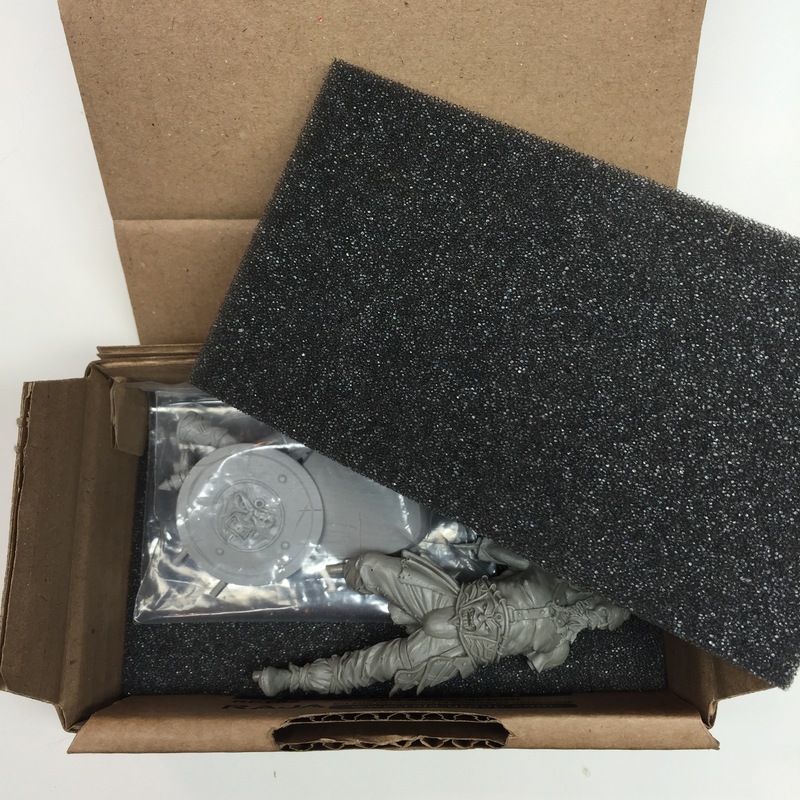 The figure arrived in a small padded envelope, inside which the figure came wrapped in a few layers of bubble wrap - enough to avoid any transit damage for such a small and lightweight figure. Underneath all of the protective packaging the figure comes in a small resealable bag with a numbered card with an image of the assembled figure. 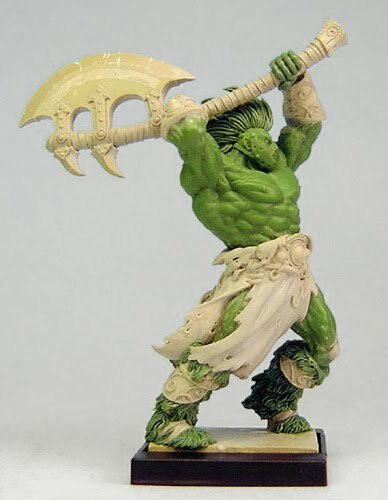 The first thing that struck me about this figure was the similarity in style and appearance to the Vorag barbarian models sculpted by the master of musculature, Jacques-Alexandre Gillois for the now defunct Ilyad Games. The Vorag were highly popular sculpts when they were available. Unfortunately they too can no longer be purchased and are rarer than hens teeth on eBay and the usual OOP figure buying sources. The Barbarian Dude clearly shares a lot of design cues with the Vorag, namely the musculature, fur boots and spiral metal work - not to mention the usual barbarian loincloth, big belt and massive axe. 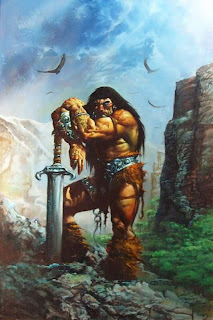 Emmanuel (or Poupée Canope as he goes by online) also openly admits to being inspired by the artwork of Simon Bisley (also an inspiration for JAG's Vorag), the artist behind the Conan and Slaine comic books. The model comes in 4 parts - the main body, the axe, arms and finally the top knot for the hair. The quality of the cast is truly exceptional! Probably one of the best I have ever seen. There are hardly any mould lines on the figure, even on areas of intricate detail, such as the wrapping on the axe haft, where you would usually expect to have to do some careful clean-up work. 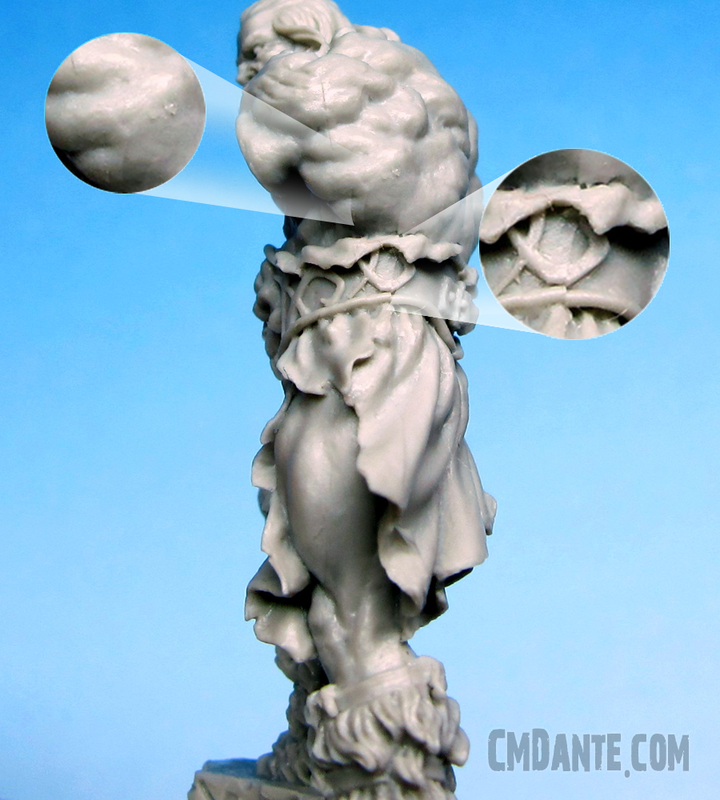 This ticks a major box in my book - I hate cleaning up mould lines! 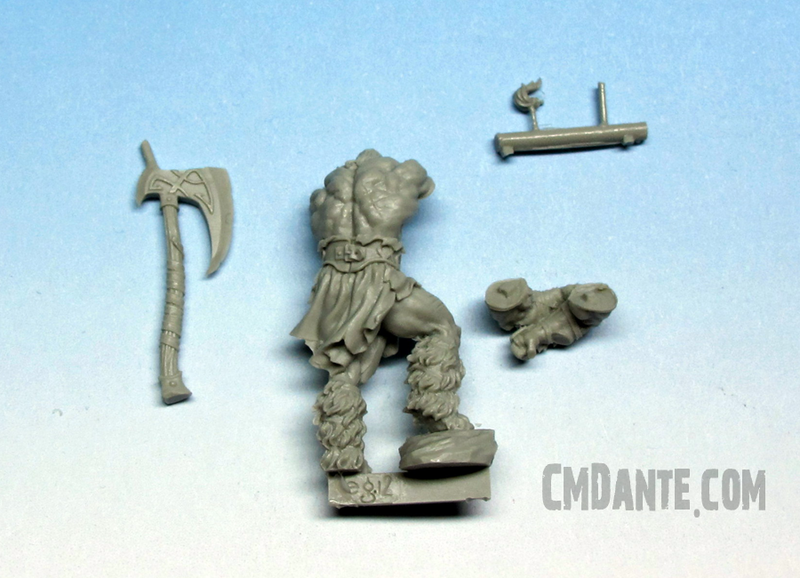 The figure is sculpted in "heroic" 32mm scale, but measures almost 40mm the the top of the hair due to being a big ol' barbarian. The detail on the cast is crisp and clean too, with even the recessed areas being sharp and well defined. The resin also appears to be pretty good quality - less brittle than Forgeworld's. While I've already stated that the cast quality is amazing, there are still a couple of small areas that need some work due to a little mould slip. I don't imagine it's possible to find a commercially cast miniature that doesn't require some clean-up work though. The most notable areas of mould slip are on the under/insides of the legs (highlighted in orange below). Fortunately these areas are quite well hidden anyway and fixing them shouldn't be anything a little putty won't solve. There is also a little mould slip and a tiny amount of graining on the left hand side of the models torso, at the belt and latissimus dorsi. While the belt is a little annoying and trickier to fix, it's still far from the worst I have had to fix. Fortunately it's also a pretty small area of the model. 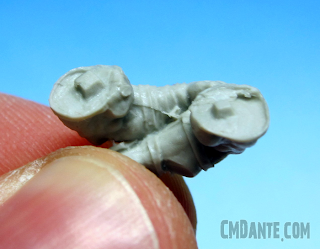 The inside of the arms also have a bit of a mould line/mould slip that will need fixed. Again though, not a very visible part of the model. Julien Casses found a similar issue with both copies of the cast he received (he was smart enough to buy two before they sold out - wish I'd thought of that as they will no doubt be worth a pretty penny!). I did notice that there was a bit of an air bubble on the joint...socket...bit (?!) of the right arm that has meant a little bit of filling will be required to strengthen the banding on the arm at this point which has become a little thin. There is also a mould vent point on the arm just below the banding at this point that will need trimmed. It's worth bearing in mind that while it might seem like there are a number of issues with this model, I am really nit-picking with the issues I've highlighted in this review. 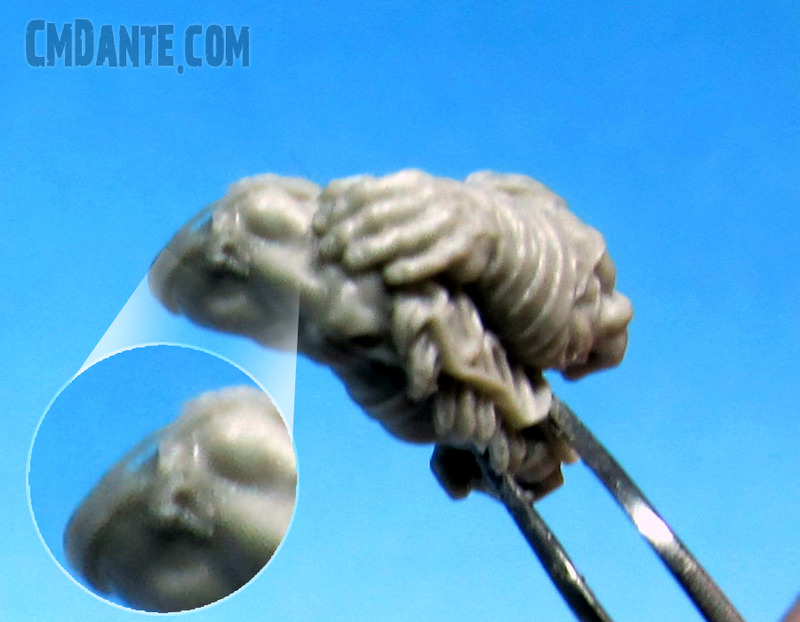 As I have already said, this is definitely amongst the best cast miniatures I have purchased, but no miniature comes without a little clean-up. 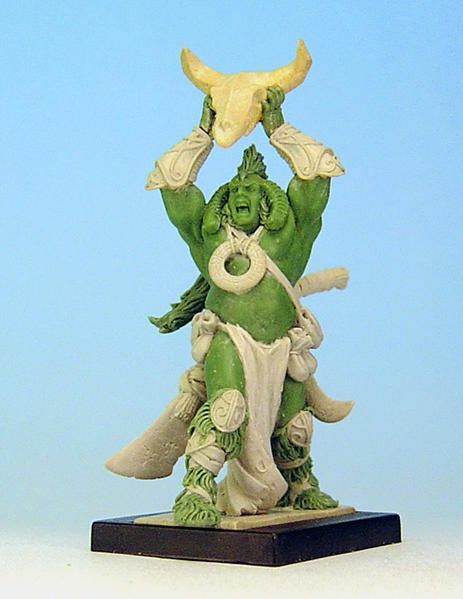 For £15, I would definitely say this miniature was worth the money and I am very much looking forward to painting him.